Present salary bill passing ECS system will be changed in to online Epayroll method. In this E pay roll method there will be given two passwords by Treasury. 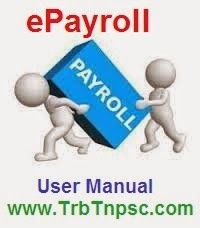 The first Epayroll password is to the clerk who prepared the salary bill. And the second password is given to the Pay Drawing Officer. On following this epayroll method the salary bill will be submitted only in online. But the M.T.C (Madras Treasury Code Register) and Special Attachment Orders only will be straightly submitted to concerned Treasury by manual. Now this ecs epayroll system introduced to Rural Development Department. It will be implemented to the other departments like Education Departments soon. We will give Our Padasalai Website Epayroll Volunteer Mr. Manogar's Cell No for your help.